Not to be confused with the similarly named game from Novomatic, Cops ‘n’ Robbers is a 5 reel, 9 payline video slot from Play ’N Go. Featuring retro design, this crime caper comes with wilds that double payouts and a free spins feature where your wins can be doubled if you manage to evade the police. Stakes range from between 9p and £90 per spin. There’s an old school feel to the design here. Think New York cops from the 1950s rather than law enforcers from today. There aren’t any lower royal value symbols, everything relates to the theme. In order of value, you’ll see handcuffs, a prisoner’s mugshot, a lag behind bars and a truncheon-wielding cop. More lucrative are the pocket watch, painting, jewellery box and bag of diamonds. The best paying symbol is the sack of cash – land 5 of these and you’ll win 83.33 times your bet. More rewarding still is the vault which is the game’s wild – land 5 of these and you’ll pocket 333.33 times your bet. If the wild forms part of a winning combination with a standard symbol, the payout gets a 2x multiplier boost and is doubled. Cops ‘n’ Robbers comes with a single bonus feature which is triggered by landing 3, 4 or 5 of the cop car scatter. As well as a payout of 3, 25 or 250 times your total bet you’ll also trigger the Car Chase Bonus feature. Above the reels you’ll see a rear-view mirror with a cop car on your tail. The free spins continue until the cop car catches up with you or you manage to escape. If you do manage to shake off your tail, the payouts accumulated during the free spins round are doubled. In terms of free spins, you will randomly receive 10, 15, 20 or 25 free spins. 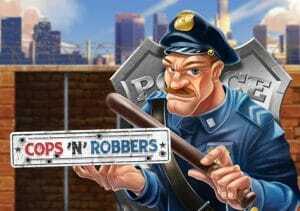 Cops ‘n’ Robbers is a simple game but an enjoyable one. The vintage visuals are nicely done and there’s a brassy soundtrack playing as you spin. The range of extras isn’t large but offers some decent potential. We’d put the variance in the medium range with potential payouts of 6,000 times your bet on each free spin – saying that, you can win up to 14,480 times your bet during the whole feature which is good. It’s not the most outlandish game you’ll see but with its solid design and features, this crime caper is well worth a spin. If you like the theme, Cops ‘n’ Robbers Vegas Vacation from Novomatic and Claws vs Paws from Playson are recommended.